We have an old fence in our backyard that I have been meaning to decorate in some form or fashion. I mean, it’s a nice enough fence but it’s just so boring, which is what prompted me to begin looking for creative ways to decorate it. What I found were 30 amazing decorating ideas for that fence and yours, as well. From homemade flowers out of paint can lids to vertical gardens, there is a way to decorate any fence that you may have and make it the focal point of your backyard – and not in a bad way. I love outdoor decorating and really adore many of these project ideas. I know my kids would have loved an outdoor chalkboard on the fence when they were younger and upcycling rain boots into planters? That’s such a creative and amazing idea! I adore my upcycling projects and really love when I can upcycle something to create something beautiful. There are even ways in here to use tires to make planters – that hang on the fence! Oh, and if you have several old tires in your yard and you want ideas on what to do with them, be sure to check out these 20 ways to repurpose those old tires. If you love working in the garden or creating a haven in your backyard, this is definitely the collection that you want to see. 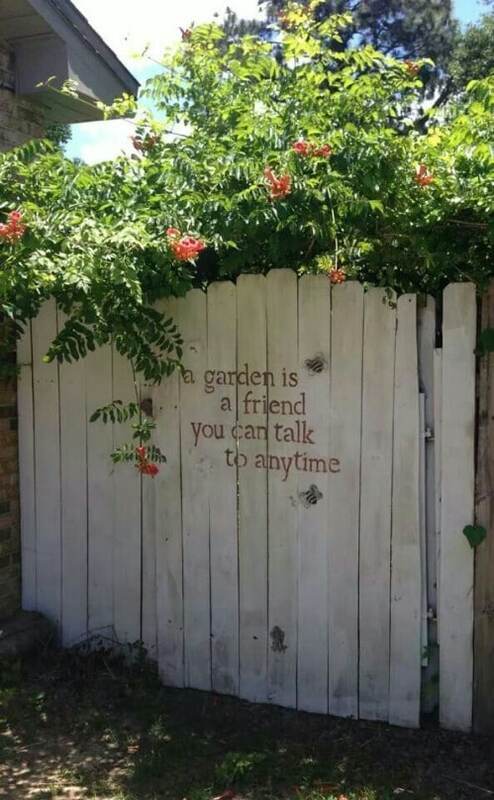 There is an idea in here to suit every fence, every home and every personality. From whimsical to elegant, you’ll definitely find a way to improve the look of your old fence with one of these projects. And, if you’re working in the backyard anyway, be sure to take a look at these 30 DIY garden decorations that add whimsical charm to your backyard. You can incorporate many of these along with your new fence decorations to really spruce up that lawn. So, if you’ve always wanted to dress up your backyard fence, this is definitely the project collection for you. You’ll find so many ways to improve the look of your lawn and I can’t wait to hear all about it! 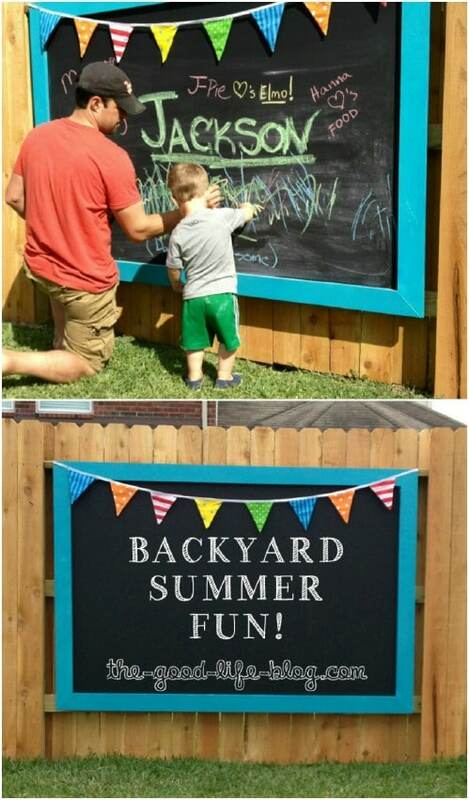 What better way to dress up a boring fence than to create a chalkboard on it? Your kids will love it and you’ll love them getting outside to play on sunny days. This is a wonderfully inexpensive way to add a bit of decoration to your fence and keep your kids busy – not to mention happy – at the same time. Turn any boring old fence into a work of art when you plant a vertical succulent garden. Succulents are so easy to care for and planting them is a cinch. A few old pallets or boards left over from other DIY projects give you all you need to make the planters. Just hang them on your fence and then plant whatever succulents you want to create a beautiful green landscaping effect. Give your fence a little boost in decoration and add a place for plants as well when you convert an old coffee table into a fence shelf. You only need half of the table, so if you have a coffee table that’s intact, you could make two of these. Just cut your table in half and then secure each half to your fence – use it to display garden decorations or potted plants. 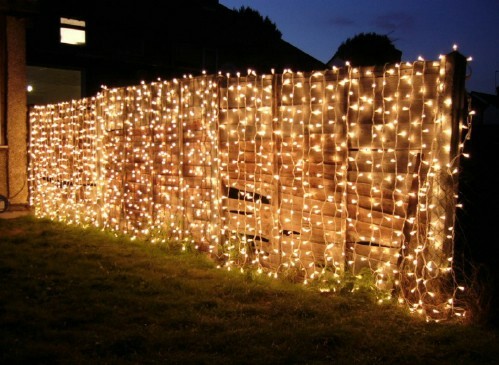 Clear Christmas lights will instantly dress up that fence. This is a wonderful way to add some décor to your backyard and give yourself some wonderful lighting for those nights out on the patio. Just cover your entire fence with lights – and you can use those curtain lights for bushes to make the job a bit easier. You can find metal art at most flea markets and thrift stores and it comes in all shapes and sizes. 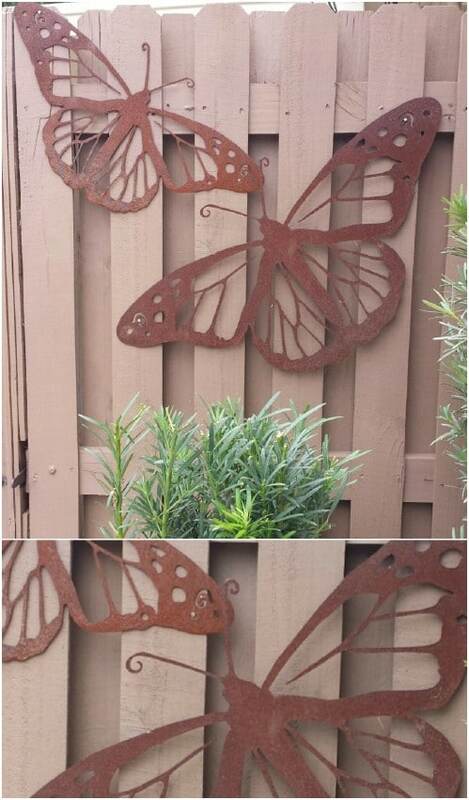 Turn that metal art into the perfect fence décor with just a little spray paint. Whether you want flowers, butterflies or anything else adorning your fence, just choose what you want and then spray paint it whatever color you need to match your outdoor décor. Butterflies are always a good choice in outdoor decorating both indoors and out. They will instantly dress up that boring old fence and give you a wonderful view from your backdoor. You can make your own butterflies from any number of materials or take a look at these beautiful ones that I found on Etsy. They’re crafted from metal and come in a variety of sizes starting at less than $40. 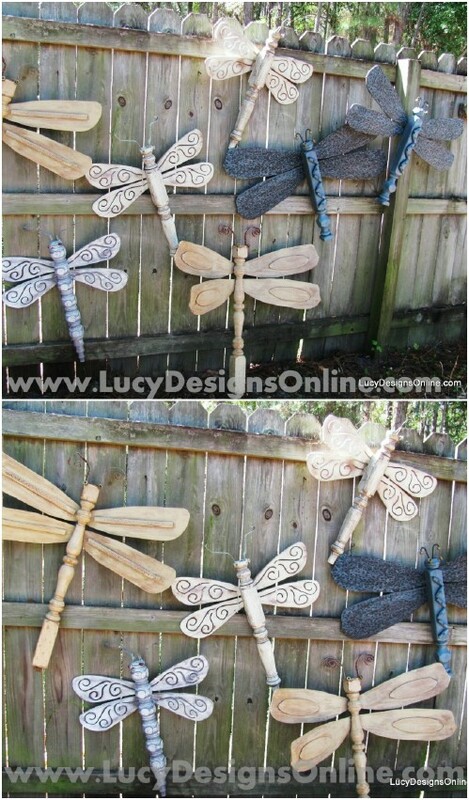 I love dragonflies and I really adore these DIY versions that are made from old table legs. If you don’t have a few legs on hand to use, you can find them really cheap at most thrift stores. They use ceiling fan blades as wings and they are just completely adorable. Paint or stain them if you want or leave them plain for a really great rustic look. 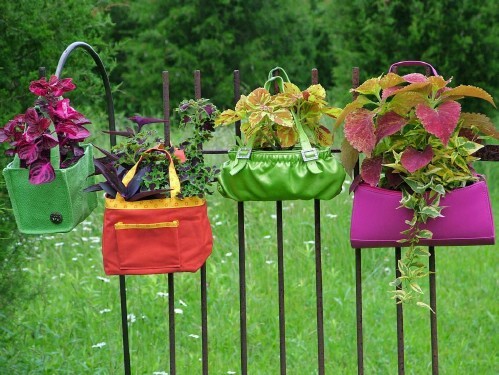 Turn old purses, totes and lunch bags into beautiful planters for your fence. Line the bags with plastic to keep soil from staining the fabric and then hang them on your metal or wooden fence with their handles. You can also just slip them over your fence posts. Add your flowers and greenery and you have a beautifully colored display that will instantly bring life to that old fence. Any junk can be turned into amazing things when you have a bit of imagination. 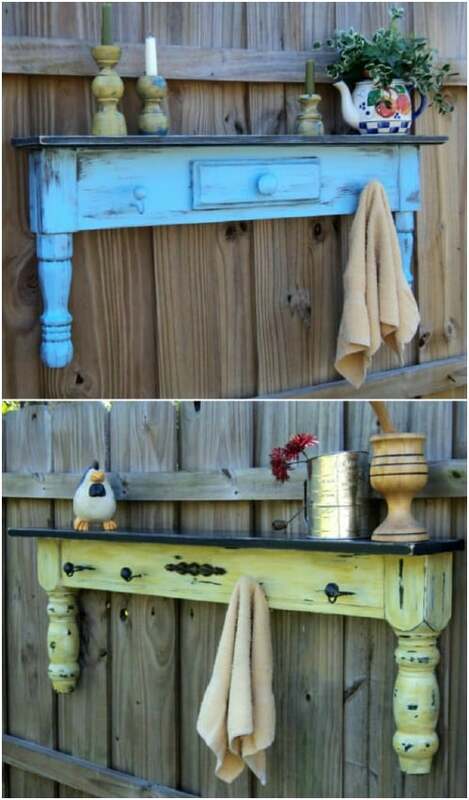 This is really a trash to treasure project that simply entails taking old items, painting them and then hanging them on your fence to create a gorgeously colored display. 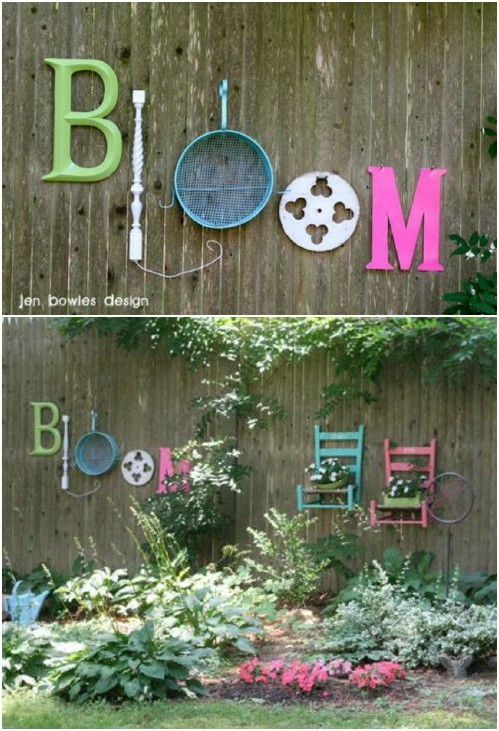 I love the use of old chairs hanging on the fence as planters and the words are created with things that were broken or otherwise unusable. Those old fence holes are horrible, aren’t they? You certainly don’t want a bunch of holes in your fence. 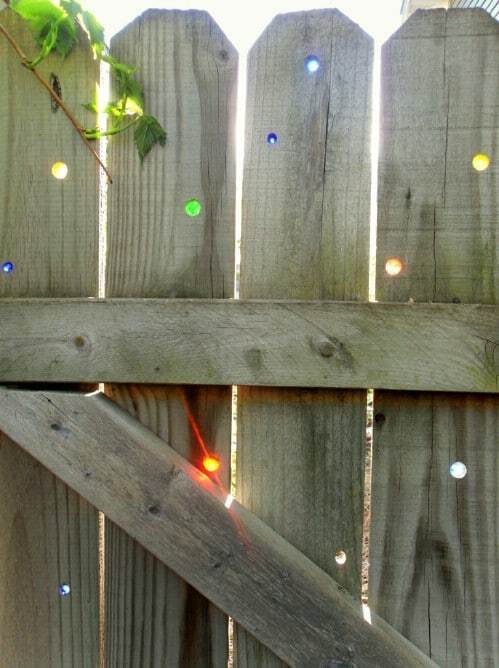 If you have them, you can fill them in with marbles and give your fence a really magical look. If your fence doesn’t have holes but you still love this look, just drill a few small holes into the wood and then secure your marbles in place. 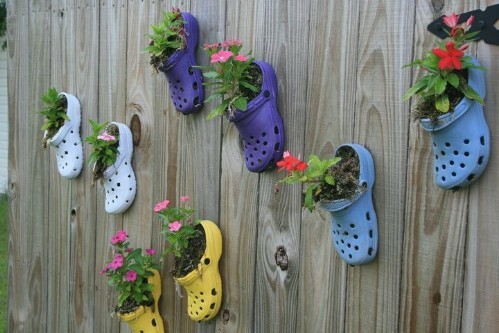 Those old Crocs that you never wear anymore or that the kids have outgrown will make beautiful planters for your fence. Instead of throwing them out, use them to dress up your fence and give yourself loads of room for planting. The holes in the sides offer great drainage for water and you could have a pair for everyone in the family. If you don’t have any old Crocs on hand, you can get cheap versions at thrift stores or the Dollar Store. 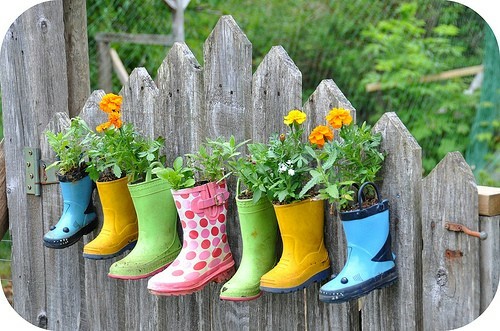 You can also turn those colorful old rain boots into beautiful flower pots that will hang on your fence. You don’t even have to have matching pairs. 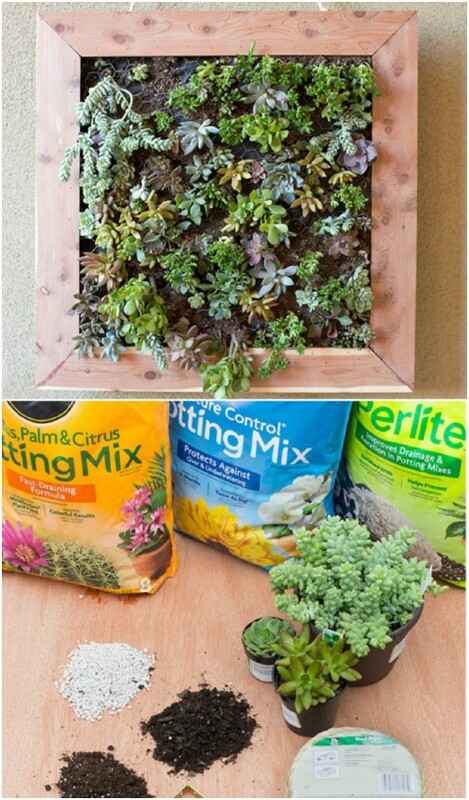 Just fill up the ones that you have with potting soil and add your plants of choice. You can find really cheap worn out rain boots at most Goodwill and other thrift stores if you don’t have any on hand. 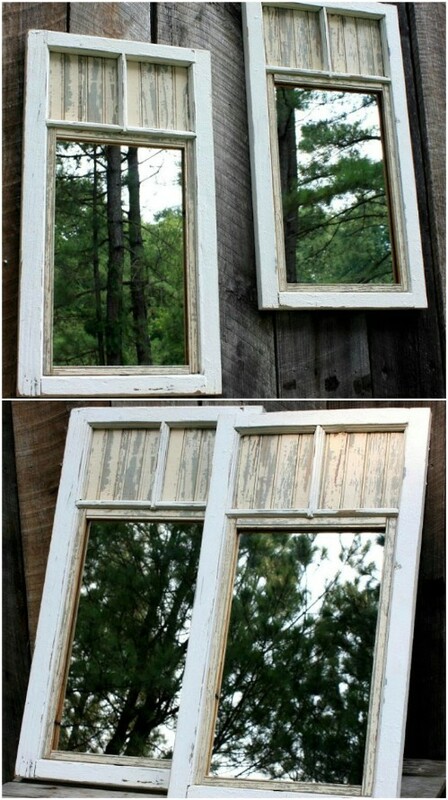 You can turn old mirrors into beautiful fence décor – or old windows that you add mirrored panes to. This is a wonderful idea for those of you who have relatively small backyards and want to give the impression of more space. Mirrors instantly make a space seem larger and this is such an easy project – and one that you can do with all salvaged materials. If you can’t decide what to do on that fence or you just really want something simple, this monogram is perfect. It’s metal and completely customizable. I found this on Etsy and you can get whatever letter you want on it and it comes in a number of colors and sizes. 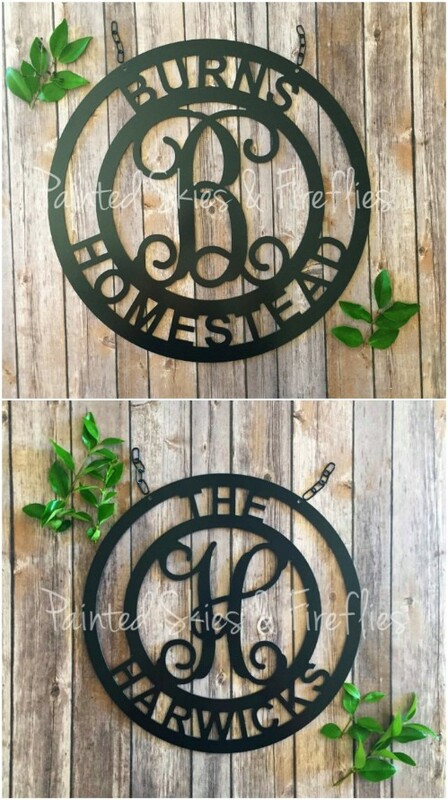 You could do this yourself if you know how to weld metal but it’s much easier just to grab this version on Etsy – you can get it for around $30 depending on the size that you want. 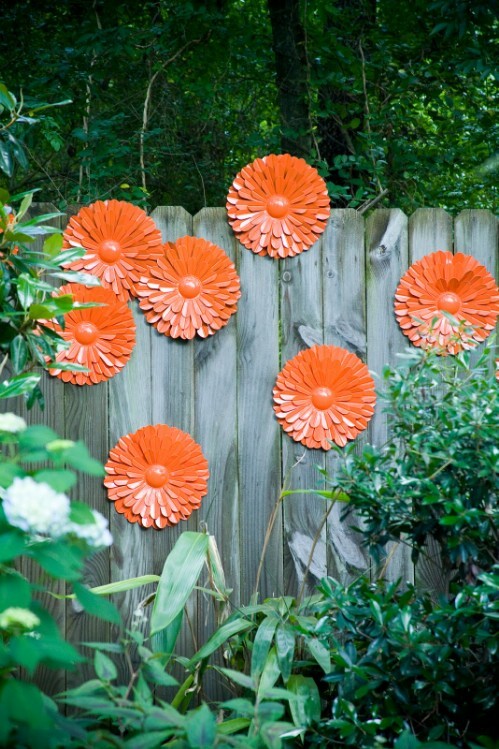 You can find all sorts of things to hang terra cotta plants on your fence. If you want to really dress it up, paint them different colors and make them really colorful. Then your fence will come alive with all the plants that you put in. This is also a great project for those broken or chipped pots. Hang them so that the broken side is one the back and you won’t have to throw them out. Take those paint lids that are left over from your past DIY projects and put them to good use as colorful flowers for your fence. Just paint them – if they’re not already painted from your other projects – and use them as the center of your flowers. Or use several to create a larger flower. Then just paint a stem and leaves and you have a great fence display that doubles as an upcycle project. Picture frames are really inexpensive at the Dollar Store or Dollar Tree and you can use them to give your fence a dramatic facelift. Just paint them whatever color you need to add color or match your patio and then hang them all along the fence. You could also create a little grouping with different sized frames. 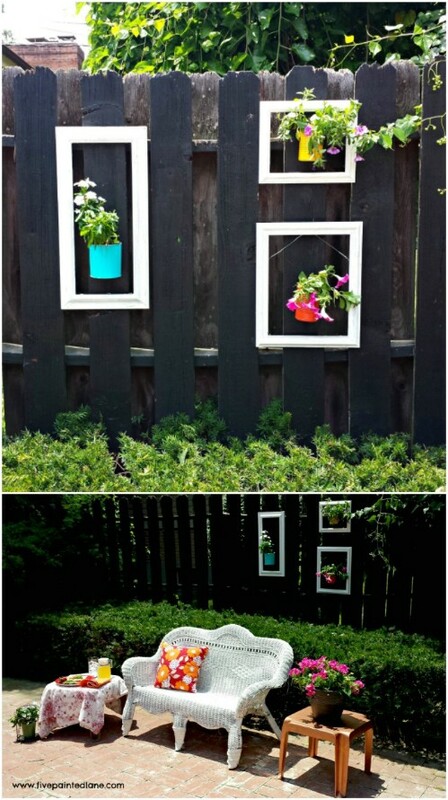 There are hundreds of ways to incorporate those frames into your fence décor. 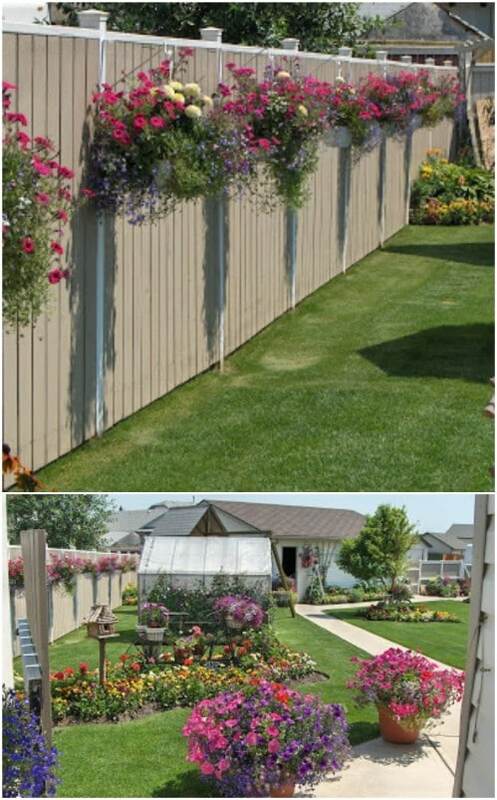 You can decorate your fence and cover any fence posts that you want to hide away with planting baskets. Hanging baskets are relatively cheap and you can use them to really give your fence some life. Those baskets will hold pretty large plants and if you hang them high enough, hanging plants will cover your fence all the way to the ground. 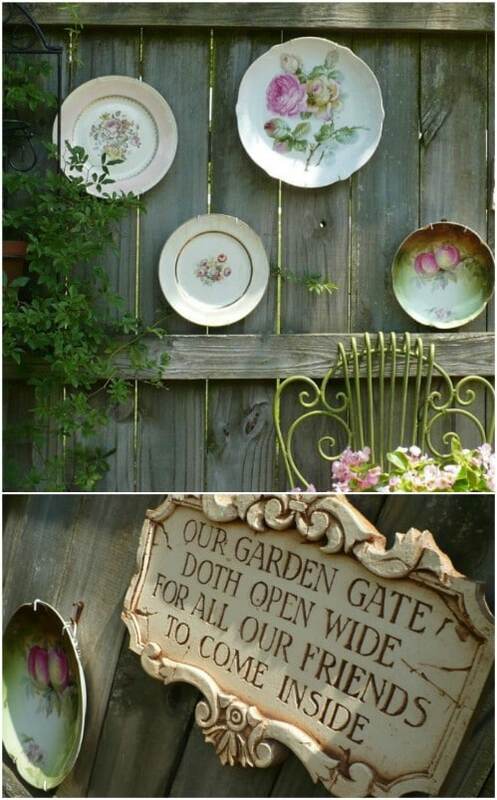 Turn old mismatched plates into beautiful garden décor when you hang them on your fence. This is a great idea for those old plates that you have that no longer have matches or you could visit your closest thrift store and find old plates for about a dollar or so each. Secure them to the fence and they will literally hang there for years adding beauty. So, this fence is actually made from recycled metal, which is really cool. You could also use this concept to cover up a fence that is already there. Just get a bunch of old metal – which you can find at any salvage yard for really cheap – and hang it in whatever design you choose over your fence. Or, if you need to make a fence, this is a great way to do it and it’s a lot less costly than traditional fencing materials. If you go through as many tin cans as I do, you may be wondering what to do with them, other than throwing them out. 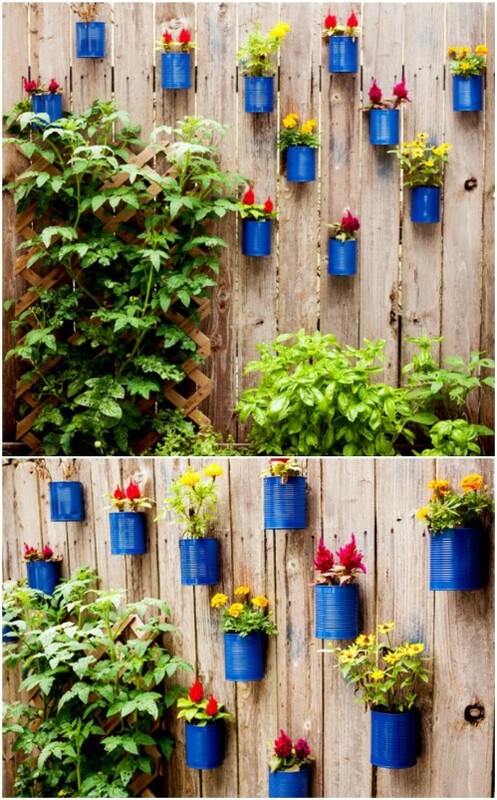 You can paint those cans and turn them into beautiful planters for your fence! 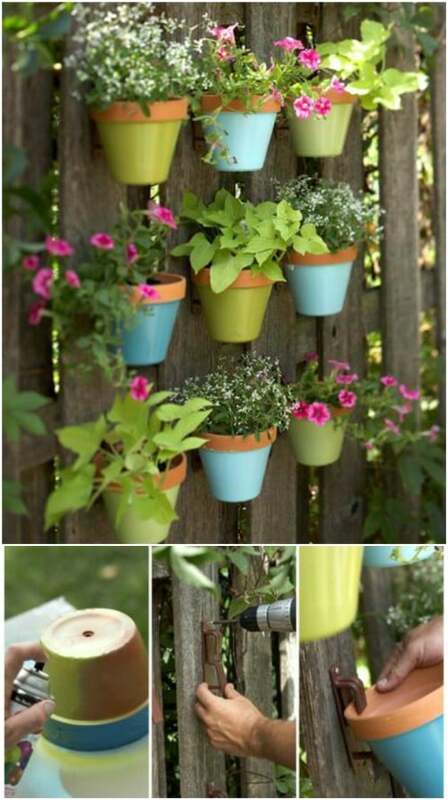 Not only does this help you to avoid filling up the landfill, it gives you a beautiful way to decorate your fence with live flowers and it’s a really easy project to complete. Just paint your cans and then secure them to the fence. Then add your plants and you’re all done. I found an entire collection of silver trays at a thrift store a few years ago for under $10. These are great for decorating so many things, even that fence. Just secure the trays to the fence and maybe do it in some sort of pattern or design. 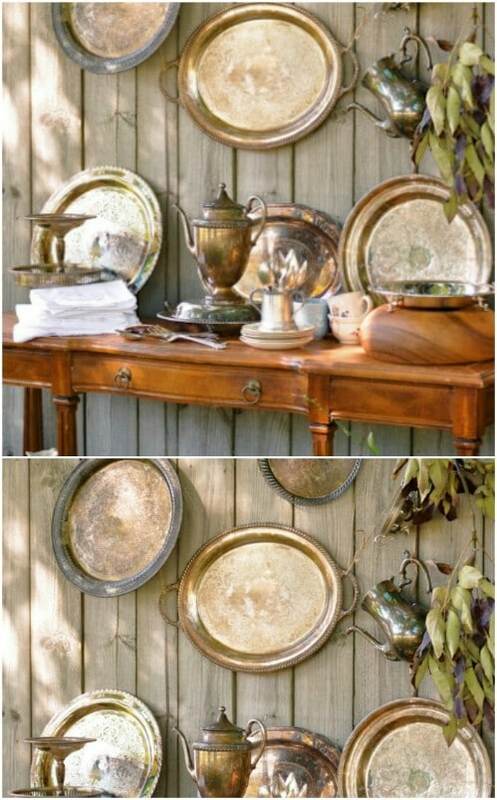 You can draw even more attention to your silver tray display if you have a table with old silver teapots or cups as planters. 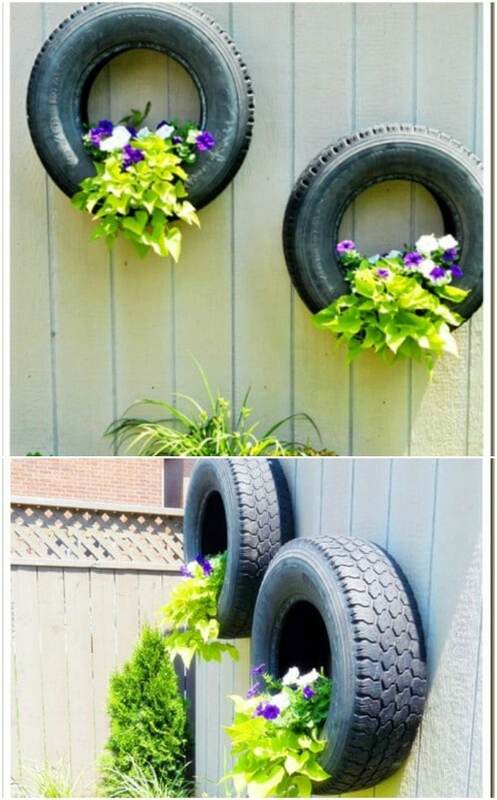 Why not hang an old tire on your fence and use it as a planter? 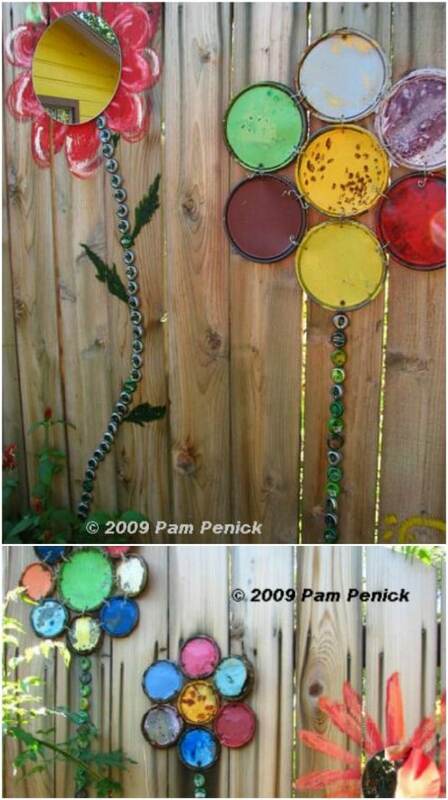 I love this idea for upcycling old tires and you get great fence décor at the same time. You can hang the tires as they are or paint them nice bright colors. If you have other tire décor – planters in the yard, etc. – this is a great way to bring it all together and the tires hang perfectly on wooden fences. 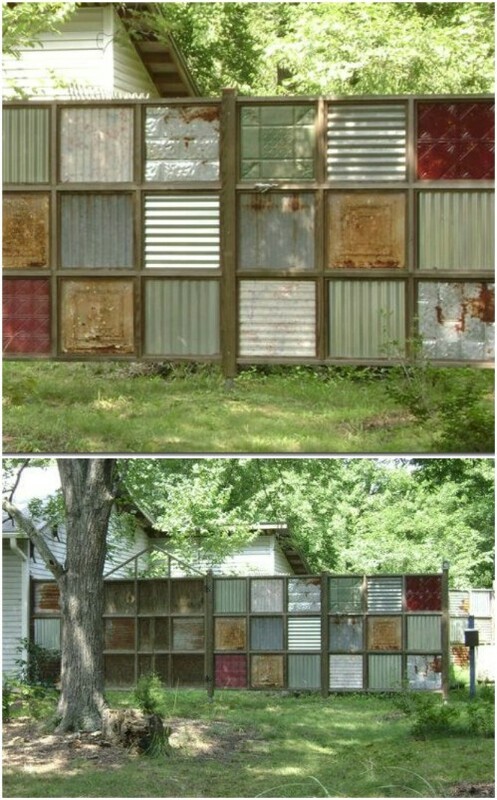 Take an old window and a couple of mason jars, and you can create a lovely welcoming display on your backyard fence. 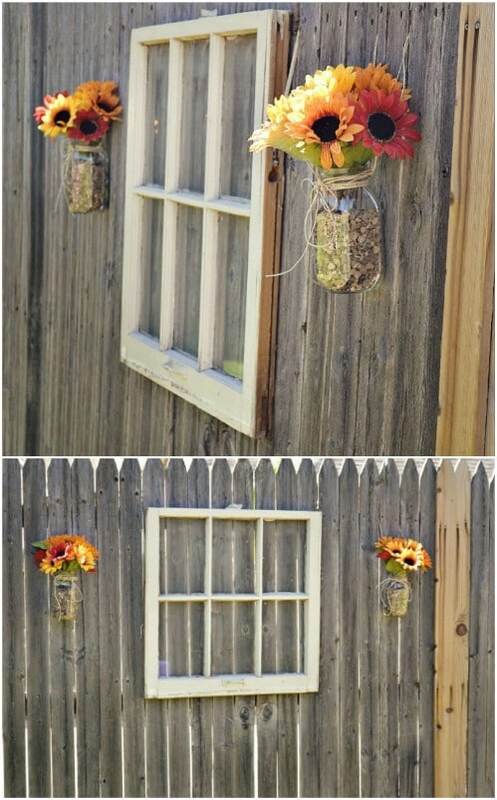 Just hang the window on the fence and then surround it with your mason jars – also secured to the fence. Use the jars to plant any number of flowers or plants. This is a great idea if you love to change your outdoor décor for the seasons. Imagine the window with Christmas decorations and the mason jars filled with poinsettias! Turn those old rustic wooden crates into wonderful shelves for your fence. Painted bright colors, those crates will instantly add beauty to your backyard and you have all that storage space for tools or plants. Just find crates in any number of sizes, paint them if you want and then secure them to your wooden fence with wood screws. 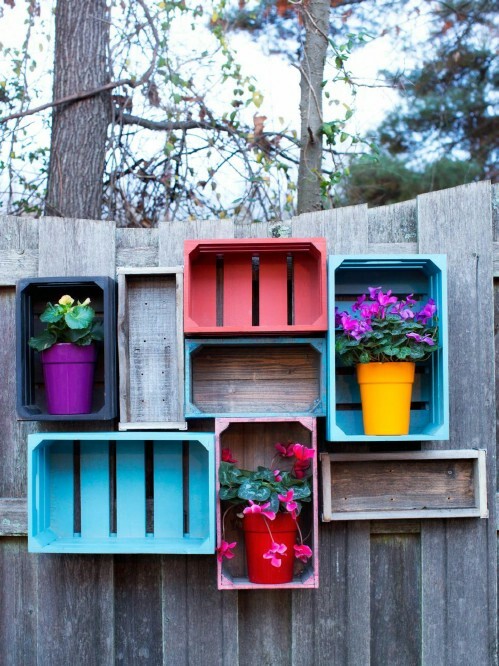 If you have enough crates, you can cover your entire fence with organizational shelving! Head to your local salvage yard and pick up several old hub caps. 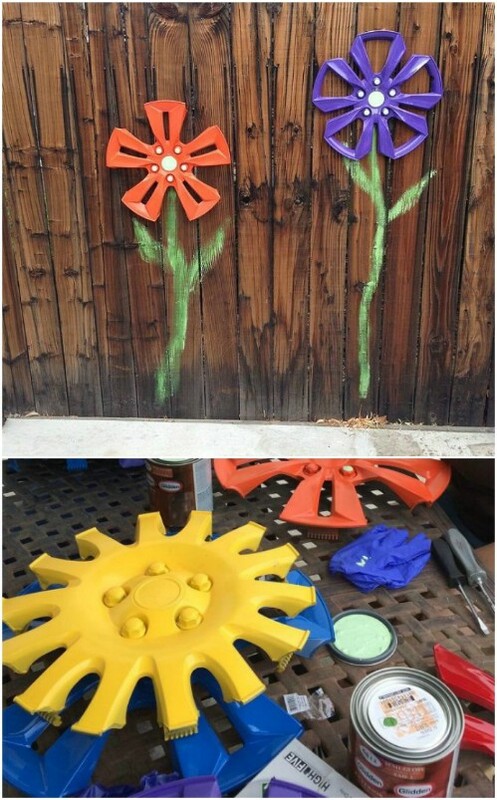 You won’t pay much at all for them and when you get them home, you can paint them and turn them into beautiful flowers for your fence. Smaller hub caps can be stacked on top of larger ones to create 3-dimensional flowers. Then you just have to paint on the stems and your fence will instantly draw attention from anyone who enters your backyard. I love those tree decorations that look like animals, don’t you? 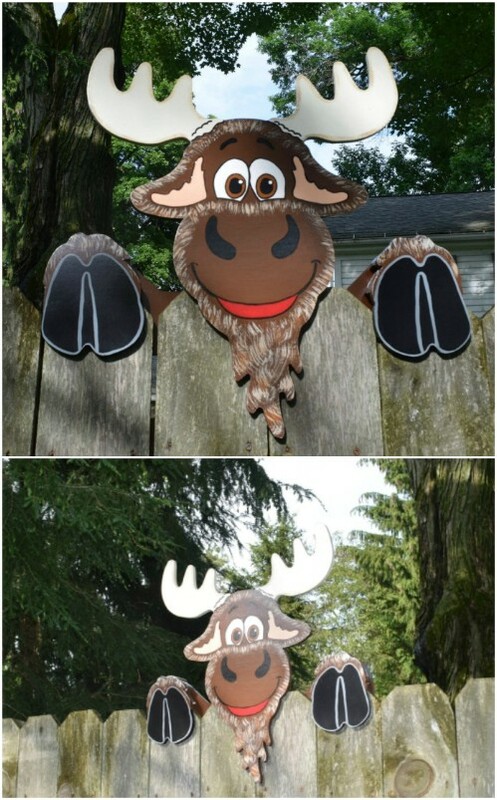 You can get about the same look with your fence when you add whimsical animal decorations. I’m not sure how you would make these. I found this one on Etsy for under $40. It’s a moose and he’s adorable. There are other animals available as well and if you really want to add some whimsy to your backyard, these are the perfect decorations to do so. If you just can’t decide on fence décor or you want to keep it really simple, why not just add a quote from your favorite movie or book – or even a line from your favorite song? You just need the quote in mind along with stencils and paint to create this look. You could also just freehand it if you’re really talented – I prefer stencils myself. You could do a different quote on every fence section or just have one centralized one. Turn that fence into something beautiful as well as useful by adding birdhouses. 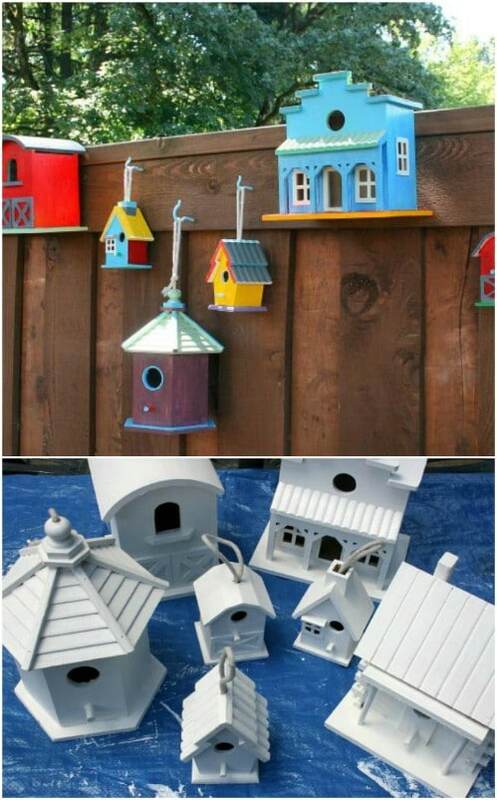 You can take any number of birdhouse styles, colors and designs and really dress up your fence. Plus, you’re giving your little birds a wonderful community to live in and if you make the birdhouses yourself, this is really an inexpensive project. You can find birdhouses already made pretty cheap, too if you shop at thrift stores or the Dollar Store. If you want to plant on your fence, a gutter garden is one of the most inexpensive ways to go. You can find old guttering at most salvage yards and even some thrift stores. Secure those gutters to your fence in any design you want and then use them to plant beautiful flowers, succulents or greenery. 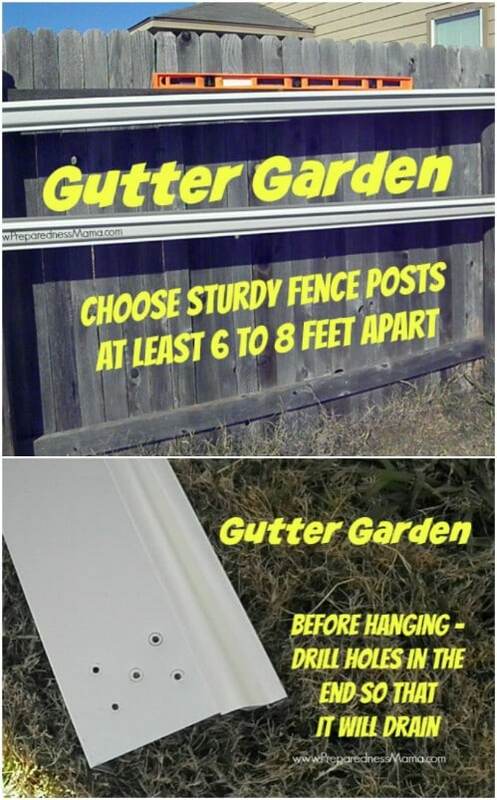 This is a fast and easy way to add beautiful life to your fence and you can even use those gutter planters for small vegetables if you don’t have a large vegetable garden.